STUTTGART, Germany — The combat zone just got a little more high-tech as soldiers in Afghanistan began testing and training on five prototype weapons that fire smart bullets. Army officials are calling the XM25 Counter Defilade Targeting Engagement System revolutionary since it is the first time soldiers will have a smart weapon in their hands. Smart weapons have some form of a processing unit that allows them to be self-guided or, in this case, have self-adjusting sights and programmable rounds. The XM25 — which is not much bigger than a standard service rifle — fires 25 mm rounds that can be programmed to explode on impact, in front of or behind an object. The weapon allows soldiers to kill enemies hiding behind walls or other cover by firing above, or to the side, of the wall from up to 700 meters away. The firing process begins with the Target Acquisition Fire Control Unit — a 2x scope assembly that includes a laser range-finder and other atmospheric sensors. The laser determines the distance to the enemy, or the wall he is hiding behind. Then the unit makes adjustments to compensate for the fall of the round over distance, elevation of the target and atmospheric conditions. Within the weapon’s sight, a display shows the gunner information like distance, adjusted crosshairs and thermal night vision. With service rifles or old grenade launchers, this firing process is done by guess work, or using handheld instruments, and making adjustments to sights manually. “Determining range is one of the hardest things soldiers have to do in the battlefield scenario,” Lehner said. Once the sights are set, the gunner can then decide whether to have the round explode before or after passing the target: Adjustments are made in 1 meter increments. 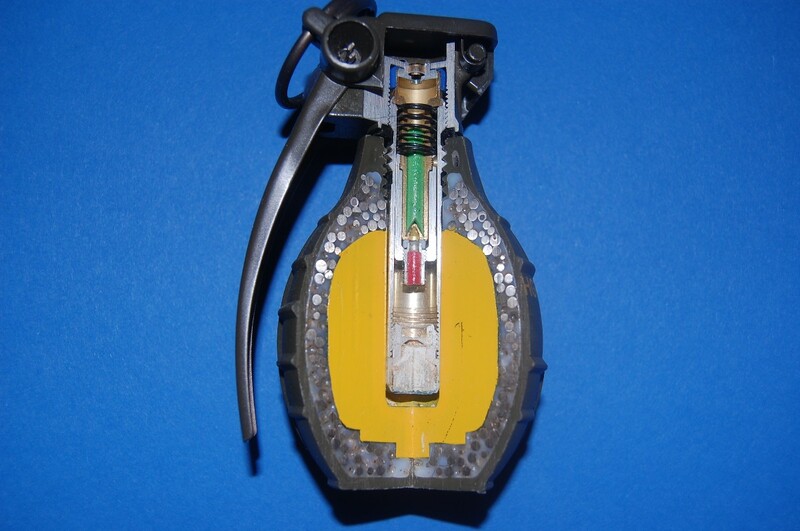 AdvertisementMicrochips in a smart round receive that information and tells the round when to explode. Like the M-320 and M-203 grenade launchers, which the XM25 will likely replace in some cases, the rounds are not armed until a safe distance from the gunner. The gunman then fires the round above or to the side of the target, and the air-bursting round explodes next to the enemy with about the same kill radius as a hand grenade. That sounds like a lot of stuff going on, but gunners are able to complete that entire process within five seconds, Lehner said. The weapon is being tested by 101st Airborne Division troops in Afghanistan. A division spokesman in Afghanistan referred questions about the testing back to PEO Soldier officials. They said they would not provide the exact location and unit with the prototype due to security concerns. The Army plans on purchasing more than 12,500 XM25 systems at about $25,000 to 35,000 apiece starting in 2012, which will be enough to put one in each of the Army’s infantry squads and Special Forces teams, according to Lehner. Future smart rounds are being developed to pierce armor, breach doors with a bigger, fragmentless explosion, and possibly carry tear gas. I'll be real interested to see how this plays out. I'm naturally skeptical of super weapons but the idea seems good. They will kill slightly more insurgents and many more civilians who happened to be in the wrong place at the wrong time. Other than that, no effect. This war isn't about the technological terrors we construct, but how we persuade and influence the populations. Better weapons and combat tactics only pushes the peas around on the plate. I don't know about that. Lethality radius is only about the same as a hand grenade. Because of increase in accuracy, I could see less civilians getting hit. But yes I agree that it won't contribute that much to the war. Firepower isn't what's lacking. On the other hand, Afghanistan is a nice reality to get all the bugs out of the weapon for future use. It sure is an interesting concept. So how many years has this been in the works counting the OICW/XM29? Still, it is good for these to finally get deployed. I hope it proves successful, but if it isn't at least we'll know before we build tens of thousands of them. - It still looks rather bulky. Compared to the final XM29 prototypes (if those were indeed functional and not mock-ups) and the XK11 it looks about the same size. - What magazines are being issued? I've read that magazines have been considered and tested containing between four and ten rounds. - When are flechette and other ammunition types planned to enter production? Lethality like a hand grenade? Hell no, not even close. Not even a little bit. 25mm OICW=141g projo. 25x137=175g projo 40x46 medium range 165-240g projo, handgrenade=350-500g projo. You still need a high level of accuracy to get an airburst within the limited ECR of this round. And you're attacking the most protected part of the target=helmet. Helmets are the most easily acquired and most widely used form of body armour. And it's a 12lb system plus batteries plus ammo. At that weight, I'd carry a 60mm commando mortar and some rounds with a real ECR and proven multi option fuze. Anyone with a functional brain AND a sense of fiscal responsibility is going 40mm medium velocity. 141g is the weight of the latest ATK version of the projo used in the 25x59B ammo (early GD-OTS ones were 132g) in the (cancelled) GD XM307 ACSW and (continuing) ATK LW25 Chain Gun. I haven't been able to determine the weight of the projo in the 25x39B ammo used in the XM25, but I believe it's less than that - it's a bit shorter. Probably in the 110-120g range. I'm more interested in seeing a high capacity HE round be develop for the XM25. More than a few congress critters at the very least. You won't see it. Unlike the 40x46 LV ammo, the 25x39B is fixed in its total length due to the need to be housed in a magazine and fed by a semi-automatic action. And you're attacking the most protected part of the target=helmet. Location:East of the Missouri and west of the Mississippi. Fire twice. The first one knocks on the noggin and tips the helmet off and the second one follows along and takes care of Mr Taliban. Wait a few seconds between shots. After the first one, the guy takes off his helmet to admire the dents in it and says (in Talibanese, obviously), "Wow, that just saved my li...."
PEO and I know DARPA had a hand in it. Hopefully these tests make them realize the utility of this system doesn't justify the cost or load it imposes on some PBI, and dust off the HMG. Probably not, that would make too much sense. Game changer? Not quite. Despite the hype, you've got a slightly more advanced grenade launcher, not a wonder rifle. The M79 changed the game more back when it was introduced, by covering the gap between hand grenades and mortars with a truly portable system (as compared to rifle grenades). Later systems, the GMGs, rifle-mounted launchers, MGL* (revolver launcher evaluated by the US Marines) and the XM25 are simply refining the rules. A field comparison between the MGL and the XM25 would be interesting. At first glance, the much simpler MGL should get the nod. As has been repeatedly stated, a trained eyeball can do much of what electronics can do, much more cheaply and reliably. $400 for a Leica LRF1200 at 10oz, and some cash for Rheinmetall MV rds(240g to 700m), use preformed frag in dedicated HE rd for 10m+ ECR. No weight penalty, much better performance. Don't the Brits use a portable mortar? Wonder how the two compare. Seems like the intented use is very similar. They used to use 51mm (2 inch) mortars which were very handy; these fired a 1 kg bomb out to 500m originally, c.850m later. They now use the same 60mm compact mortar as US forces - it's in a different performance class, but it (and especially the ammo, at around 2 kg) is a lot heavier. Are you sure it's the same one? I thought the US used the home grown M224 whereas we use an Austrian (NORICUM?) mortar. We don't need a fancy weapon, we need to open up the ROEs. We have an amazing array of high tech weapons that are sidelined most of the time due to idiotic ROEs. Wheres our air power? MLRS attacks? Artillery sweeps? 2000lb JDAMS? We have got to get over our lunatic ideas that you can have war without substantial civilian casualties. We are getting our troops killed with stupidity. At least I have not heard a senior GO talk about sitting down and drinking tea with the enemy lately. Thank Heavens!